I adore this simple, flavorful broth. Miso gives the broth it's rich flavor and fresh lemon keeps the broth light and bright. 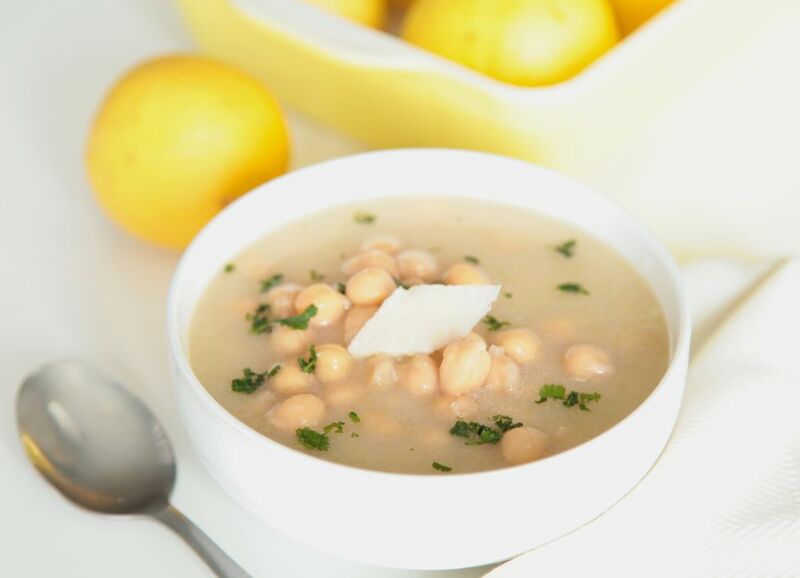 This soup can be made with canned chickpeas, but boiling dried chickpeas gives the soup more flavor. Make this soup once, and you're sure to have some ideas for variations. Add tofu, shrimp or shredded chicken, fresh baby spinach, chopped carrot, brown rice or quinoa. Drain and rinse the soaked chickpeas. Put in a pot with 5 cups water. Bring to a boil, lower the heat, partially cover and simmer until the chickpeas are tender, about 1 hour (cooking time for chickpeas will vary). This step can be also be done a day ahead. Save the chickpeas and the water they are boiled in. In a soup pot, heat olive oil over medium-low heat. Add the shallot and cook gently for 8 minutes, until the shallot is very soft and slightly brown. If it starts to get too dark, turn the heat down to low. Add the garlic, and cook 3 to 5 minutes more. Cooking the shallot and garlic slowly on low heat is done to build flavor, so don’t rush the process. Pour the lemon juice into the pot, using a wooden spoon or spatula to scrape up any bits of shallot and garlic stuck to the pot. Add the chickpeas and their broth, plus 2 cups water. Bring to a gentle boil. In a small bowl, whisk miso with a ½ cup or so of the warm broth until smooth. Pour back into the soup pot. Simmer with a lid 10 minutes. Serve the miso soup with shavings of Parmesan cheese on top, fresh herbs or scallions, and hot sauce, if desired. At the grocery store, you're likely to see several types of miso. Three basic types are white, yellow and red. White miso has the mildest flavor and is very versatile for cooking. It's not quite as salty as other types of miso. Yellow miso has a slighty stronger flavor. Red miso, which can range in color from red to brown, is saltier and more intense. Kept in a sealed container in the refrigerator, miso can keep for up to a year. Chickpeas and garbanzo beans are the same legume. Depending on the brand, canned chickpeas/garbanzos can be very good and extremely convenient. However, if you have the time, cooking dried chickpeas can not only give you tender, creamier, more flavorful beans but the cooking water can also be used as broth. Plus, dried beans are less expensive than canned. Dried chickpeas should be soaked before cooking. Cover with plenty of water in a large bowl, as the chickpeas will expand as they soak.